When it comes to keeping your car in tip-top shape, regular brake inspections are a crucial part of any car’s maintenance schedule. If you want to come to a safe and secure stop every time you use the brakes, you need to know that every brake component is functioning at full capacity. To do that, it’s helpful to know the difference between each component. 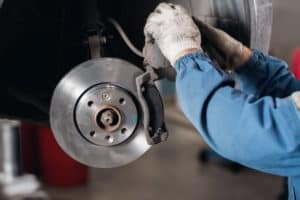 In this article, our team at BMW of Stratham will help Portsmouth, Exeter, and Stratham drivers learn the difference between brake pads and rotors. If you want to learn more, feel free to reach out to us! Brakes 101: What Are Rotors? If your car uses disc brakes, rotors are the discs themselves! You’ll find one on the inside of every wheel, spinning along at the same pace as your wheels are moving. When you apply the brakes, the brake pads, (which we’ll get to in a minute) compress around the rotors, slowing down and/or stopping your car. These steel discs are thick and built to stand up to pressure, but braking hard and frequently does cause them to heat up. Over time, that heat can cause the rotors to glaze over or even warp, making the applied pressure less potent when you need to stop. Even if that doesn’t happen, the rotors will wear down (very slowly) over time and will eventually need a replacement. Typically, if you’re performing brake repair, the brake pads will need replacing much more often than the rotors-and we’ll show you why. Brake pads are steel-backed plates with frictional material bound to the surface. They face the disc brake rotors and press up against them when the brakes are applied. The friction this produces is what brings your car to a halt. 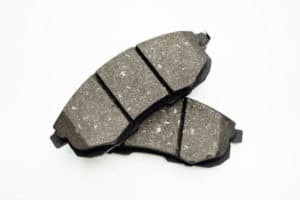 Over time, this constant rubbing up against the rotors will cause your brake pads to wear down or even glaze over, reducing their effectiveness when it comes to braking your car. When this happens, you’ll want to install a new set of pads to keep the brakes working well. How Often Do I Need Brake Inspections? Typically, you should have your technician perform a brake inspection once a year or every 12,000 miles. Chances are, you won’t need to replace your pads or rotors that often, but frequent inspections help you catch problems early. Your technician may find other problems, such as failing calipers or low brake fluid, too. For brake pads, you should replace them when they’re worn down to less than a quarter-inch thick. You can often gauge this yourself, as the brake pads are usually visible through the wheels. Warped or glazed rotors can be resurfaced or replaced by your technician, and they’ll know just when it needs to done after a quality brake inspection. We hope you learned a lot about the brake pads vs. rotors differences. If you need new pads or rotors for your car, don’t hesitate to schedule brake repair at the service center at BMW of Stratham. Our trained and certified technicians are happy to help Portsmouth, Exeter, and Stratham drivers find and install the perfect pads and rotors to keep their vehicles ready for the road!